Plumbers traditionally used plumbing snakes to help take care of clogs in toilets and drains. For tough jobs, however, professionals may resort to hydro jetting, which uses a powerful stream of water to push debris through a line. Plumbing snakes, or augers, are available at home improvement stores for personal use, but you should leave hydro jetting services to the pros. Plumbing snakes have a long metal tube with a cable on one ends and a crank on the other. The cable is compression-wrapped and looks like a flexible drill bit. 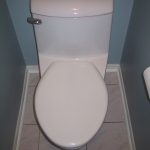 Plumbing snakes for home use are generally 3 feet long and have a straight tube or a J-shaped bend. 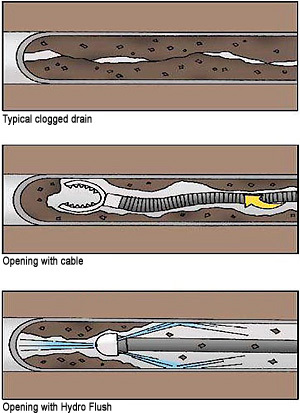 Straight plumbing snakes are best for drains in sinks, while J-shaped augers are best for toilets. By placing the end of the snake into a drain and cranking the cable so it extends into it, you can dislodge, catch or push a clog so water can flow freely once again. Plumbing snakes come in handy when the suction action of a plunger does not offer enough power to clear a clogged drain. A plumbing snake can also alert you to a more serious problem in a drain. For example, if a snake fails to clear a clog, this may be an indication that a tree root in the line is to blame. In such an instance, you should hire a professional. Hydro jets are similar to power washers in that they use a powerful stream of water. Most hydro jet machines have adjustable pressure gauges, and most plumbers set the water spray at 2,000 to 4,000 pounds per square inch, or psi. The blast of water forces grease, minerals, hair, built-up materials and other debris through the problem drain. In some instances, plumbers can use a hydro jet to break up tree roots. Before hydro jetting, a plumber inspects the drain with a small video camera to find the cause of the clog and to learn if a pipe is broken or weak. Unlike a plumbing snake, a hydro jet does more than just break up clogs. The spray of water also removes debris built up on pipe walls, such as grease or minerals. 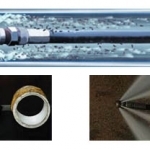 Consequently, routine hydro jetting services can help maintain the health of pipes. Furthermore, when a plumber uses a hydro jet, he does not need to use harsh chemicals to help break up debris trapped in a pipe. You ought to take part in a contest for one of the greatest websites on the web. I will highly recommend this site!